The Advent Season is underway! Last week Adam Ericksen and I prepared ourselves for this season of hope and anticipation by hosting our first ever Girardian Virtual Bible Study. Thank you so much to everyone who joined us, and those who watched and listened when the video was posted later. We plan to continue to host this virtual Bible Study weekly throughout the year, same time, same place. So tomorrow, Wednesday December 5th at 10:00 am CT, please join us again on the Raven Foundation Facebook page so that your comments and questions can shape our discussion and our understanding. We don’t just value your questions, insights and perspectives, we need them. As mimetic creatures – and as the Body of Christ – the only way we learn and grow is together! Last week, reading Luke 21: 25 -36, we found hope in the darkness. Jesus tells us to raise our heads when troubles befall us, for our redemption is at hand. In the midst of violence and chaos, we are reminded that violence has no place at all in God, but rather comes from ourselves. This is a hopeful message because it means we can take responsibility for our violence, and it is within our power to stop it. Jesus us shows us that the violence we attribute to God is our own. By disassociating violence from the eternal God, Jesus shows us that violence is not eternal but temporal, fleeting. Violence can be stopped, and because of Jesus’s model of forgiveness and restoration, we have the power to stop violence. Jesus shows us that God is Love and empowers us to live into our destinies as living images of God, living images of Love. This is a hopeful message indeed. This week, we meet John the Baptist. We will actually discuss both this week and next week’s Gospel as they flow together, so we will start with Luke 3:1-6 and continue with verses 7-18. We will go from grand, eloquent language of preparing the way of the Lord – “every valley shall be filled and every mountain and hill brought low” – to cursing “broods of vipers” and warning of “unquenchable fire.” What is going on? In the Girardian Lectionary, Paul Neuchterlein explains that Girard sees the leveling of the mountains and filling in of the valleys as a mimetic crisis of undifferentiation. This means humans, in the fog of violence and rivalry, lose distinctions as they turn into doubles of one another, fighting for the same things. This seems like a pessimistic observation, and a contrast to my understanding of this verse as a call to justice – to lift up the poor and prick the conscience of the powerful. Could it refer to both a mimetic crisis and the beginning of justice at the same time? Could the same apocalyptic event be both a mimetic crisis and the beginning of justice? What is the fire of which John speaks? He warns of fire and wrath for those who do not repent, but then says the one who follows him will “baptize with fire.” Is there a difference between fires of wrath and fires of purification? Who lights these fires? We will refer to this upcoming Sunday’s Old Testament reading – Malachi 3: 1-4 – for a deeper understanding of fire and its uses. As the church undergoes the liturgical season of Advent, the world is undergoing a season of tumultuous upheaval. Wars rage. Social, racial, and economic injustices impose pain and suffering. Unnatural, human-enhanced disasters are unraveling a world being poisoned by pollution. Now is the time to prepare – in our hearts and in our homes, in our societies, in our nations – a path for Love. It’s now or never. Where, now, do we see the poor being exalted? Where is the hope for the homeless, the refugee, the racially and economically oppressed? How are the powerful being challenged? How are we being challenged in our privilege? Join us as we ponder these questions. We may tie into other readings as we see fit… or as you suggest! And we will always seek ways to interpret the events of today through the wisdom of Love that we find in Christ through the scriptures. Please join us if you can, Wednesdays at 10:00 CT on the Raven Foundation Facebook live, or post your comments and questions on the Raven Foundation website or on our Facebook page. Have a blessed Advent and a Merry Christmas. 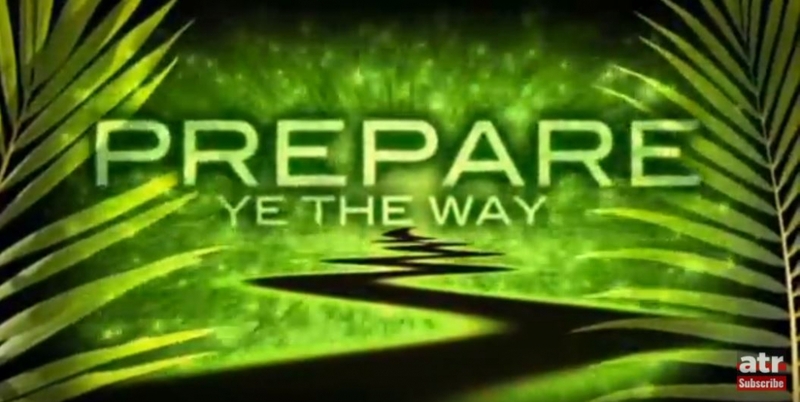 Image: Screenshot from Youtube: “Michael W. Smith – Prepare Ye The Way (Official Lyric Video),” by Apostles that Rock.